Appear regularly in ETnow, CNBC TV18, ZEE Business, Bloomberg tv and few regional media and my articles and views are published in print media like ET, Business standard, Livemint, Businessline and few wires also. Mr. A. K. Prabhakar 26 years of experience, last worked with AnandRathi Financial Services from 2006-2013 as Senior Vice president Equity Research , after starting his financial career as a Equity research analyst specializing in industries like cement and sugar. He has worked independently on many projects prior to joining Anand Rathi Financial Services. Mr. Prabhakar has worked at NBFC since 1990 to 2006. 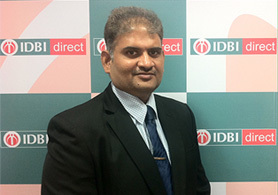 Mr. Prabhakar has a unique style of accessing data applying Techno-Fundamental tools. Full time analyst in the Indian Stock Markets, since 1990.